One of the main things we wanted to achieve when planning the Charlotte HVAC Guide, was to give users a way to get HVAC cost estimates in less than 1 minute. When we looked at all the heating and cooling system variables that need to be taken into consideration for a full hvac system in a home, it was quite a challenge to come up with a set of basic options, that can be used to give you a rough estimate, and still be relevant for most of the homes in our area! The end result is what you see the bright red arrow pointing to across the top portion of the content… The Charlotte HVAC Cost Estimate Tool. 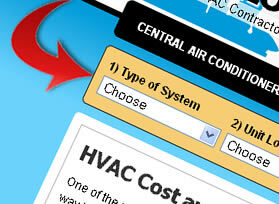 In this Charlotte HVAC article, we want to show you how to use the cost tool on our website. In order to get the most from our HVAC cost estimator, you need to know the following information about your home and how it’s heated or cooled. Split systems usually include 2 or more components, with half the system being outside your home, and the other half, a gas furnace or air handler, located in a utility closet, attic or crawl space of your home. The unit is “Split” into separate components, and connected through electrical and refrigerant lines. A packaged unit, like a gas pack or heat pump packaged unit, consists of one piece of equipment that resides on the outside or roof of a home, and is connected to your homes duct system. There are no air handlers or furnaces inside your home, everything is comtained into one unit outside. Next, we need you to tell us where the HVAC unit is located in or around your Charlotte home. Knowing where the current unit is located help us understand how difficult the installation may be at your home. For split systems, the indoor furnace or air handler may be in a first floor, basement or utility closet. In the attic or a second floor utility room, or even under the home in your crawl space. For packaged systems in our area, its very common for the unit to be on the side or rear of the home. On rare occasions, they are installed on elevated platforms or on the roof. Knowing how you heat your heat your home, whether its gas (natural gas or liquid propane) or electric heat, helps us determine the right choices for your home heating system. In many cases, a home thats heated with natural gas or propane will have a gas furnace and central air conditioner system installed. Homes heated with electric heat will need a heat pump system. We realize this is not a perfect system, but will help most users get to the right choice if they don’t know where to start. The overall size of your home measured in square feet, is not in any way a scientific method to determine the proper size unit for you. In fact, it is nothing more than a basic guideline for very rough estimates of sizing. 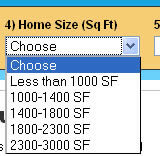 It does however give our HVAC Cost Estimator a basic range of the approximate sized unit you may need for your home. The only way to get a proper sizing of the hvac system is to get a free onsite evaluation, and have the Contractor perform a thorough and accurate load calculation. 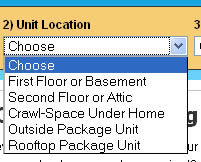 Based on the need to replace the unit “right now”, your price can fluctuate. The cost of your home heating and cooling system can easily be effected by supply and demand… and knowing that you need heating or cooling immediately, can cause the price to go up. We have built a few variables into the system to take into account your need to replace the system today, or 4 weeks from now! Press the Estimate Cost Button! After you have completed the 5 easy steps needed to give you a basic hvac price, you will notice that the “Estimate Cost” button on the right side is no longer grayed out, and you are able to submit the information and get a basic estimate of hvac system cost. Once you click on the “Estimate Cost” button, our HVAC Estimator tool goes to work and combs through the options in our system. Usually within 3-5 seconds, you will be given a very general “Good, Better or Best” cost estimate, that’s designed to help you understand the different factors effecting your overall system cost. These are Very General Estimates and the only way to get an accurate HVAC Price quote is to have a contractor provide a free estimate for you. Look at the screenshot below to get an idea of what you can expect. Jump to the top of this page and get started now!